Choosing a water source for your dripping irrigation system is important. 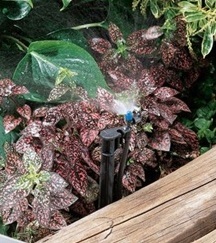 Connecting a dripper irrigation system to a hose faucet is one of the simplest ways to install a drip water system. If you have chosen to install your micro irrigation system on a garden hose spigot, there are certain micro sprinkler parts you need. First, you will need an anti-siphon or backflow device. This prevents dirty irrigation water from infiltrating your clean drinking water. You will also need a filter, pressure regulator and hose faucet adapter. As well as these things, you should have distribution tubing, drip tube and end caps. For easier installation, set tubing out in the sun so it can soften before you install it. If you using your micro irrigation system for potted or hanging plants, you can run supply line up to your hanging baskets and secure to the wall with tubing straps. For potted plants placed on the ground, you can secure the distribution tube with tubing stakes. You will want to punch holes using a hole punch tool where you plan to place emitters or water drippers. There should be no more than 15 drippers used in each sprinkler drip line. In the holes you have punched, insert a barbed coupling where a micro sprayer can be inserted. Remove any end caps in the distribution line to flush the system. Replace the end caps and test your water emitters and drippers to adjust flow rates and to make sure they are all working properly. For flower beds or ground cover areas, you can connect your distribution tubing the same way. Connect low volume micro sprayers with barbed couplers that insert into holes you have punched. Micro sprinklers should be placed no more than 10 feet apart and there should only be between 8 and 16 micro sprayers used per drip irrigation line. Stake down the drip irrigation line with tube stakes. You may also want to place the low volume sprinklers on drip stakes to customize their heights. Test the drip system to make your flow rates are where you need them to be and that all micro sprinklers are working properly. Be sure to flush the system before placing the end caps in each end of drip line. For shrub and tree areas, flag drippers work best. There should not be more than 45 water emitters on a single irrigation drip line. You will want to stake the distribution tubing down to the ground and place an insect plug at the end of the supply tube. Test your water drippers to make sure they all work properly and have the correct flow rate. Be sure to flush water through the tubing before inserting your end cap. If you want, you can attach an automatic watering timer to your garden hose spigot to automate watering. This will help save more water and more money by reducing water usage. You can set watering times, durations and intervals as your yard needs.